The ShredStar X13 Pro is a high performance mobile shredder for desk side use. A particle cut shredder on castors that has a anti-paper jam function. An LED indicator informs you when the ShredStar X13 Pro shredder is in Stand-by mode and the machine will stop automatically when the waste container is full or has been removed. You can check how full the bin is using the handy inspection window. 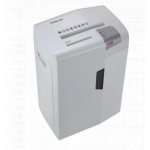 This document shredder on rollers ensures data security in the workplace. The separate CD cutting unit easily shreds CDs and DVDs, credit and store cards. The shredded material is sorted into the separate CD waste container and you can dispose of it separately. The LED display enables you to easily view the operating state of the machine. An integrated light barrier starts the device automatically and switches it off again after the paper feed ends. The automatic reverse rectifies paper jams and ensures smooth operation. The level of the waste container is always visible through the inspection window, making timely emptying possible. The waste container is easy to remove and empty.